The only thing better than a pink diamond ring? 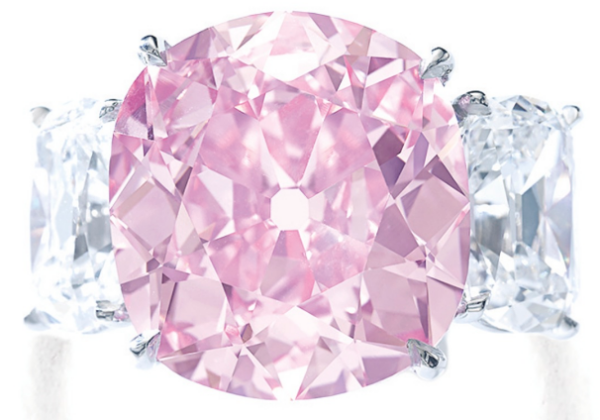 A pink diamond ring with a royal provenance. 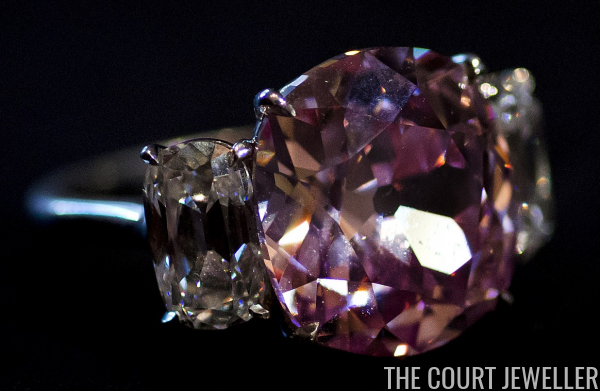 No, scratch that: a pink diamond ring that belonged to a princess with a scandalous, fascinating life and to a fascinating, reclusive American heiress. 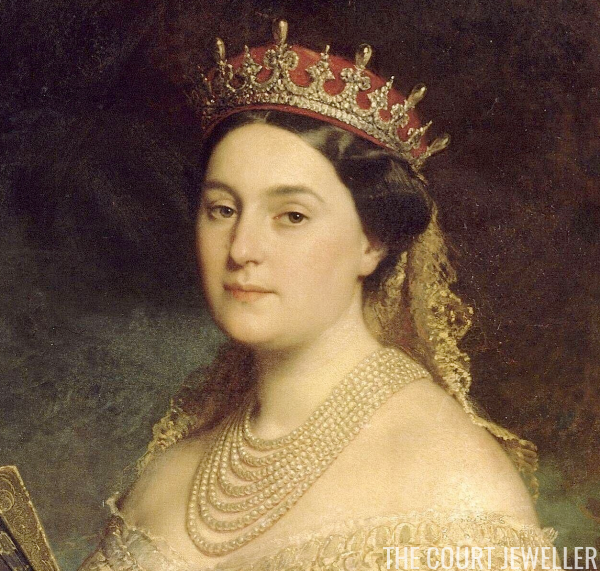 So today, we're in luck, because we're going to marvel at a ring set with a pink diamond that belonged to both Princess Mathilde Bonaparte and Huguette Clark. Princess Mathilde was completely intriguing, and her pedigree was impeccable. She was the niece of an emperor (that'd be Napoleon Bonaparte!) and the granddaughter of a king (Friedrich I of Württemberg). Her father, Jerome Bonaparte, was briefly King of Westphalia, a collection of northern German territories. Tsar Nicholas I of Russia was her mother's cousin. And she was almost Empress of France -- she was briefly engaged to her cousin, the future Napoleon III, until he was imprisoned in 1840 following an attempted coup. Mathilde's eventual husband, Anatole, was a Russian nobleman; the two had no children, kept their own lovers, and ended up living separately for most of their marriage. After leaving Anatole behind, Mathilde lived lavishly on her own in a mansion in Paris, where she became a famous salon hostess. It was a remarkably liberated life, full of artistic and literary culture, and certainly glittering with jewels. Mathilde died in January 1904; that June, an auction of her possessions was held in Paris. A pink diamond, set as part of a necklace, was included in the sale. The stone was bought by Michael Dreicer of Dreicer and Co., a New York-based jewelry firm. Dreicer had the diamond mounted in a ring, which he sold to William Andrews Clark, a fabulously wealthy United States senator from Montana. Senator Clark's diamond purchase was almost certainly earmarked for his much-younger second wife, Anna Eugenia La Chapelle. They had married in Paris in 1901, when he was 62 and she was 23. The diamond was eventually inherited by William and Anna's younger daughter, Huguette Clark. Huguette's life was, in a word, fascinating. She inherited an incredible fortune from her family, and although she was briefly married, she lived alone for almost her entire adult life. And when I say alone, I mean alone -- as a recluse, holed up in her magnificent 42-room abode on Fifth Avenue. The pink diamond wasn't there with her, though; it was apparently socked away in a bank vault in the 1940s. In 1991, Huguette abandoned her magnificent home to voluntarily reside in a series of hospitals in New York, even though she still owned multi-million-dollar homes in Manhattan, Connecticut, and Santa Barbara. When she died in 2011, she was 104 years old, hadn't seen her family in years, and had an astonishing -- really almost unbelievable -- collection of possessions. Huguette's life was so completely intriguing that it was quickly documented in a book, Empty Mansions. Her art collection was auctioned at Christie's in 2014, and this pink diamond, now armed with both a royal provenance and a fascinating, reclusive backstory, was put up for auction at Sotheby's in April 2015. 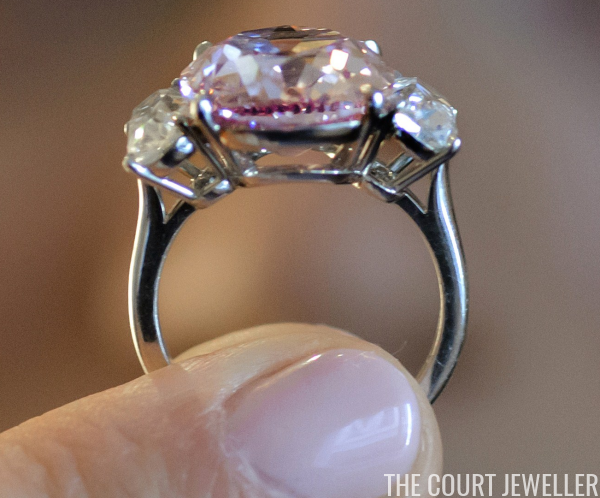 Pre-auction estimates for the ring were set at $14.6-18.7 million. 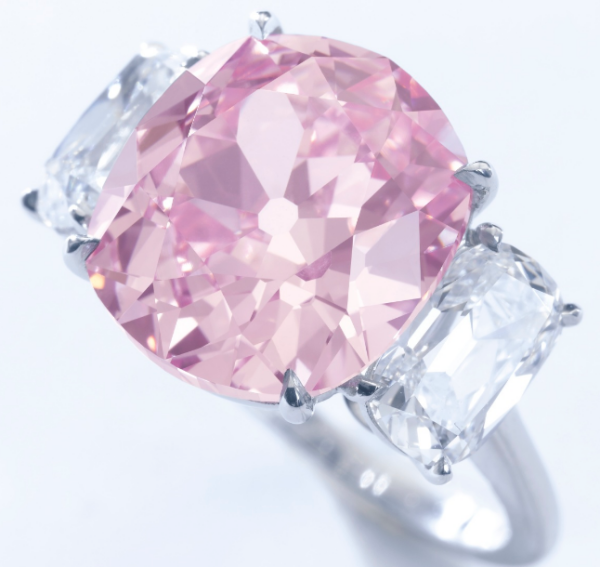 The auction notes describe the "magnificent fancy vivid pink diamond ring" as "set with a cushion brilliant-cut fancy vivid pink diamond weighing 8.72 carats, between cushion brilliant-cut diamonds weighing 1.09 and 1.12 carats." Often, pieces of jewelry with such high auction estimates fail to sell -- but not this time. When the auctioneer's hammer fell, the ring had sold for $15.9 million, with the buyer purchasing not only an astonishing gemstone but also an excellent story to tell.